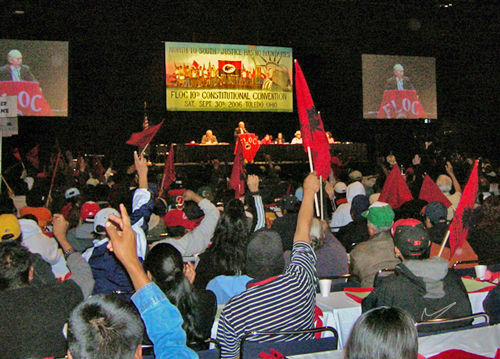 Hundreds of delegates with the Farm Labor Organizing Committee (FLOC) convened in Toledo, Ohio, Oct. 3, during their 11th national convention. The on-going battle to organize tobacco workers in North Carolina and the need for comprehensive immigration reform were major themes highlighted at the meeting. At the end of the triennial meeting FLOC members and supporters marched and rallied throughout the streets of downtown Toledo to demand that R.J. Reynolds, the country’s second-largest tobacco company in North Carolina, give workers a voice on the job. FLOC is a 40-year-old AFL-CIO labor organization that represents about 12,000 migrant farmworkers, mostly in Ohio and North Carolina. The union is attempting to organize up to 20,000 tobacco cutters in the Southeast beginning with R.J. Reynolds Tobacco Co.
For more than two years, Susan Ivey, CEO of Reynolds American, the parent of R.J. Reynolds, has refused to meet with workers and FLOC to discuss the conditions of thousands of tobacco farm employees. Tobacco farmworkers live in extreme poverty, suffer from nicotine poisoning and exposure to deadly pesticides and harsh working conditions. They have few enforceable human rights protections. “The fact that farmworkers still live in extreme poverty and are vulnerable to many work-related illnesses is not only a tragedy but a moral disgrace hidden from the eyes of most Americans,” said FLOC President Baldemar Velasquez at the convention. Velasquez, 62, founded FLOC as a college student in 1967. His parents were migrant farmworkers and he was raised working in the fields and orchards of many states from Texas to the Midwest. After experiencing many years of mistreatment and exploitation Velasquez began organizing migrant workers to stand up for their rights following the model of Cesar Chavez. Beatriz Maya, originally from Argentina, has been a leader with FLOC for 17 years. At this years convention she was re-elected as Secretary-Treasurer. She spoke with the world in a phone interview. Maya said the convention overall was a success and over 300 worker delegates attended. FLOC farmworkers pick all kinds of crops including cotton, tobacco, berries, cucumbers, sweet potatoes and much more, said Maya. She said delegates from North Carolina at the convention, most of whom are H2A workers from Mexico, are concerned about their current wages. President George W. Bush slashed them from $9 to $7.25 in a last minute decision before leaving office, she said. The workers are proposing that their wages go back to the previous scale, said Maya. And with the union, they will be in a better position to fight for better wages including benefits, she notes. Fred Azcarate, director of the AFL-CIO Voice at Work department spoke at the convention saying the struggles of all workers are connected. “Whether you work in the fields or in a factory, whether you work in construction or communications, we know the best way for us to get ahead, to make a decent life for ourselves and our children is by forming a union and engaging in collective bargaining,” said Azcarate. “Workers in the U.S. have seen an almost steady erosion of wages,” he said. “Wall Street has gotten rich while the rest of us struggle. Something has to change…it’s going to take work at the grassroots level. We need to build our power. We need to build our unions,” he said. In Ohio the main concern for FLOC members is the fight for immigrant rights among undocumented workers including the right to own a drivers license, said Maya. Ohio also borders Canada and another important concern is the border patrol and the lack of cooperation between local law enforcement agencies and immigration officials, she said. “Without immigration reform it’s an obstacle for everyone,” said Maya. “Farmworkers should be able to live a normal life with the right to a good education for their children and decent wages in order to make a living,” she said. The fact is that immigrant workers contribute, they pay taxes yet they hardly have any benefits such as unemployment compensation or social security, she said. Maya recalled one farmworker woman who was separated from her two small children by the Department of Human and Children Services at a work camp. The accusations were false, notes Maya, so FLOC got involved and contacted the Mexican consulate. Both parents were from Mexico and the children are U.S. citizens, she said. The case was eventually settled out of court and the mother was reunited with her children. But unfortunately, they were deported, said Maya. “The main point is that the children got to be back with their mother,” she said. Speaking at the convention Velasquez said neo-liberal policies that originated in Washington are a direct result of the millions of undocumented workers migrating to the U.S. in search of jobs. “America is reaping what is has sowed. Migration does not happen on its own. NAFTA (North American Free Trade Agreement) has displaced more than six million Mexican corn farmers, who have no other option than to go to the U.S. seeking a way to support their families,” he said. Despite the many struggles farmworkers continue to face, the convention was very exciting with amazing participation from the workers, said Maya. “It’s a unique setting for them to tell their stories and share ideas giving them the space to speak out about their rights and needs,” she said. Over the years FLOC victories include the Campbell Soup strike and boycott and the Mt. Olive boycott.